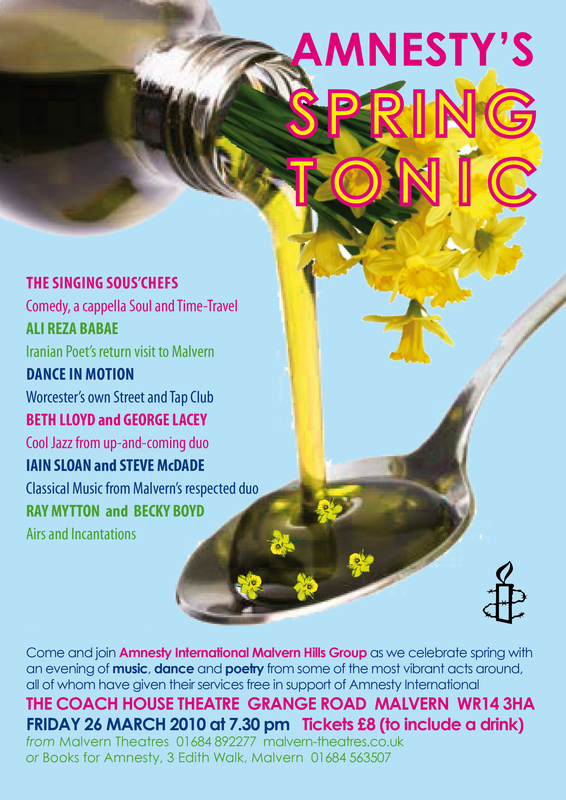 Spring is round the corner and to come and celebrate it with AI Malvern Hills Group at SPRING TONIC next Friday 26 March at 7.30 at the Coach House Theatre, Malvern (off car park next to Malvern Theatres). There’s a great variety of music, comedy, dance and poetry, and it will be an opportunity to have fun and raise funds for Amnesty at the same time. Tickets are only £8, including a free glass of wine or soft drink, available from Malvern Theatres 01684 892277, or Books for Amnesty, Edith Walk, Malvern 01684 563507. No booking fee at the bookshop.